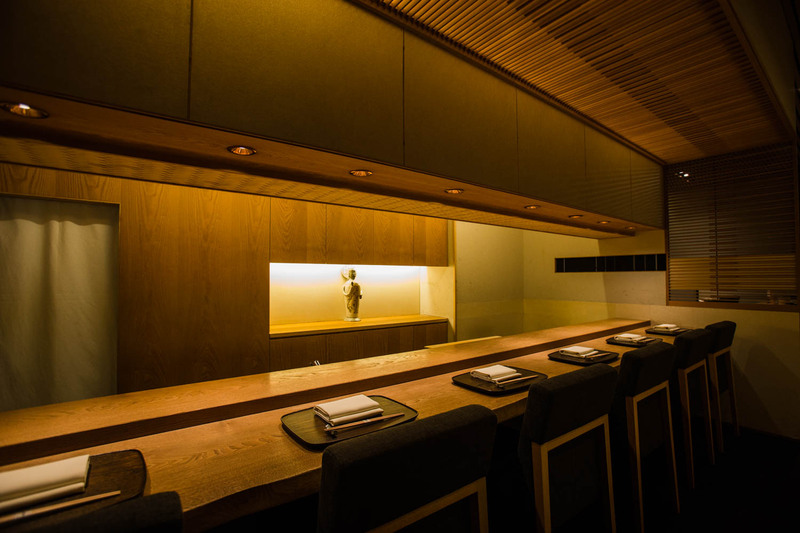 With exquisite balance and an element of surprise enveloping a deep Japanese core, Kohaku has the youngest three-star Michelin chef in Japan, but its unparalleled appeal cannot be measured in any amount of stars. The beautiful harmony of a dining experience at Kohaku exemplifies the true spirit of Japanese cuisine, weaving together all the components of this country’s profoundly intricate culture. The enchanting Kagurazaka never fails to make you feel like you have been on a journey to another time or place. 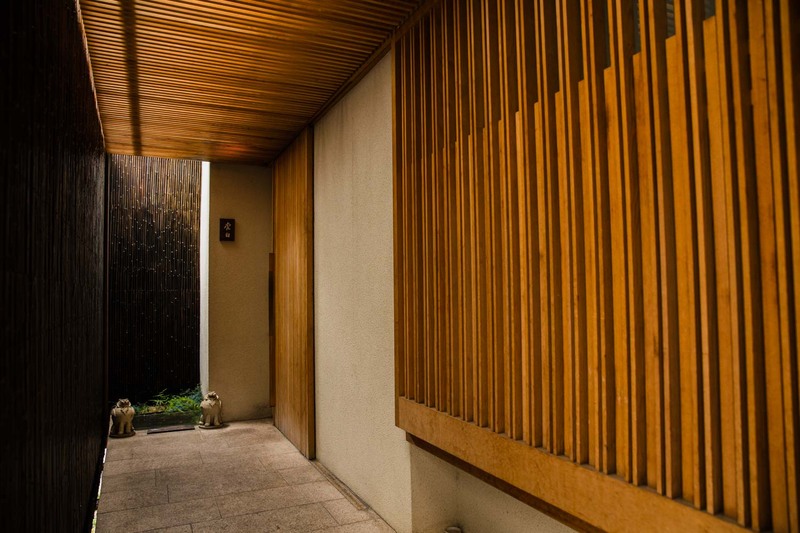 In a small laneway off the busy, steeply-inclined main street, a façade of hundreds of perfectly aligned thin bamboo lengths has already captured your attention. Golden light slips between the bamboo, inviting you into the world beyond. 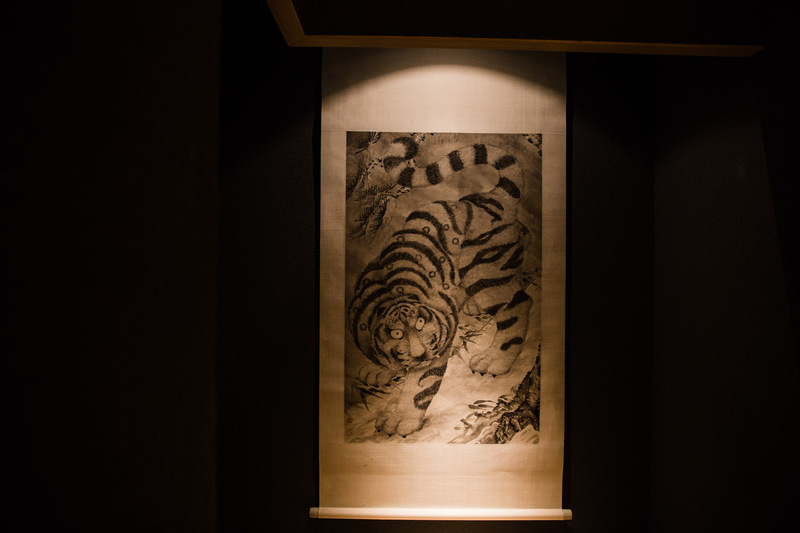 Past the powerful painting of a white tiger, the meaning of the restaurant’s name, cream sliding doors, delicately papered walls, and a stunning flower arrangement adorn the calming wooden interior of the minimalist open-plan dining room. At once modern and traditional, the counter and table seats afford the perfect sense of privacy. Chef Koizumi pushes the boundaries, yet stays true to the tenets of Japanese cuisine. 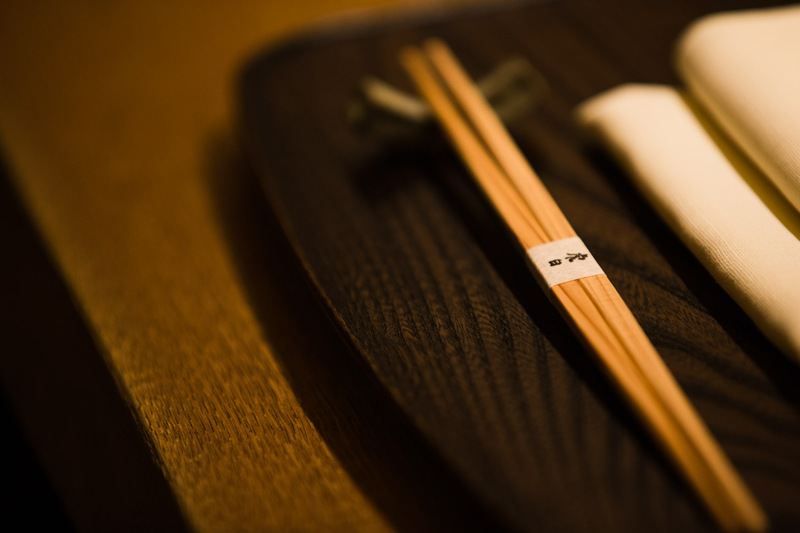 Neither adding nor subtracting too much, and always with a twist, this is Japanese cuisine influenced by other styles and ingredients from around the world. Butter, bean chili paste, star anise, truffles, Shaoxing wine – these ingredients have no place in traditional Japanese cuisine, and yet Koizumi infuses them seamlessly into the cuisine of Kohaku. It works because there is meaning behind every combination of ingredients he creates. Take for example the tender shinjo dumpling, a favorite traditional dish. Rarely, or perhaps never before, has it been made from the premium ingredient nodoguro blackthroated seaperch. And nowhere else does the chef first charcoal-grill the fish to liven the aromas and flavors before forming the dumpling without a single binding ingredient. The condensed flavor of the premium buttery fish in this surprising and sumptuous dish is proof that Koizumi can successfully take his cuisine not just one, but two or so steps away from tradition. Chef Koizumi firmly believes that customers are the ones who truly train a chef. By paying constant attention to their reactions and every day giving it his all, he is creating something beautiful with his cuisine and the complete dining experience, to be savoured in that moment. With the strong and unwavering foundation of Japanese cuisine, Koizumi’s search for ingredients always starts with finding the best components for dashi, as well as the best seasonal fish and vegetables so diners may appreciate a strong sense of the season. His shift to incorporate new ingredients meant a search for new trusted suppliers, which all came through introductions for which he is extremely grateful. Occasional visits to Tsujiki help maintain relationships with key suppliers, and bountiful ingredients are also shipped direct from the source. 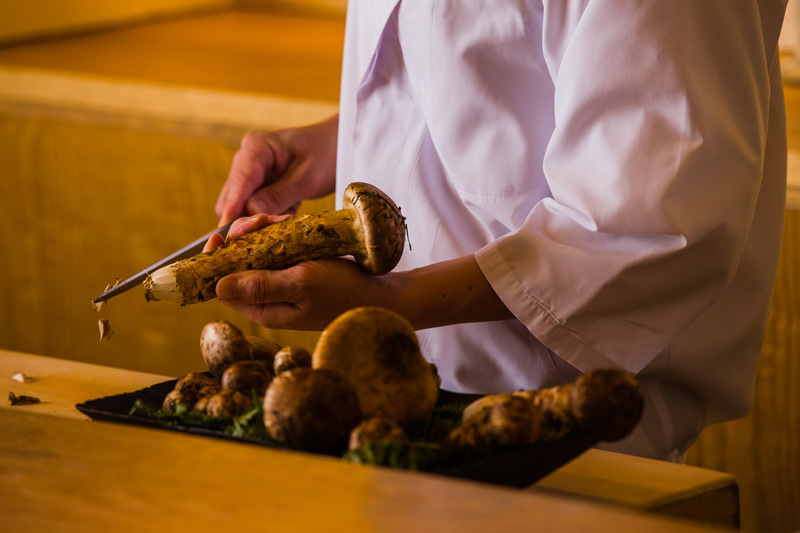 Curious to discover the regions and people behind his delicious ingredients, Koizumi visits the matsutake mushroom farmers of Iwate, shocked at first to see how deep in the mountains they go, and the fishermen who fish the deep blue sea of Genkainada off the coast of Fukuoka and Saga. He has such deep respect for the work they all do, and he wants to layer his passion on theirs, and bring it alive in his cuisine. Koji Koizumi strikes a beautiful balance between professionalism and friendliness. He is warm and has a keen eye for hospitality, which almost certainly contributed to him becoming the youngest 3-star Michelin chef in Japan, at the age of 36 (at the end of 2015). Originally from Yokohama, his path to culinary school was not planned. He simply followed a friend into an open day, not knowing what else he wanted to do. During his trial lesson, he couldn’t even crack an egg, but the undeterred Koizumi signed up, beginning what is now an illustrious cooking career. After graduation, his teacher introduced him to a good friend, the well-respected and ever-passionate Hideki Ishikawa, who at the time was the head chef at Okazaki, a kappo restaurant in Yaesu. Koizumi began working under Ishikawa, desperate to hone his skills and touch and taste as many ingredients as possible. When Ishikawa decided to go independent in Kagurazaka, Koizumi went with him and they have worked together ever since. The chance for Koizumi to create his own cuisine arose when Ishikawa decided to move locations, vacating the space that became Kohaku in 2008. Experimenting to find his own style, he was driven to create new Japanese cuisine based on traditional methods, namely drawing out the best flavor from each ingredient. 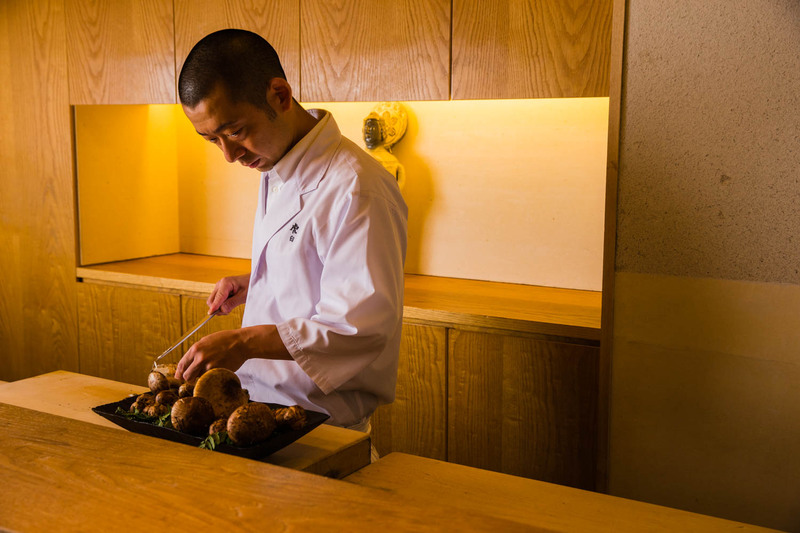 Koizumi worked tirelessly to polish all five senses by eating, listening, experiencing and building a memory bank of ingredients for inspiration. He loves dining out at on all types of cuisine, travels to Kyoto every two months to experience quintessential Japanese hospitality in different forms, and visits temples and galleries, exposing himself to many different forms of expression. He firmly believes that this immersion of the five senses and the accumulation of daily experiences is the key to innovation. Guided by the spirit of his master Ishikawa, who is just around the corner, Koizumi works with fluidity of ideas and passion, and never compromises on his cuisine. He treats his staff well, giving everyone a chance irrespective of age or experience. His greatest goal is to please his customers and send them off with full hearts, and the key to creating a pleasurable space for customers is to ensure everyone, including suppliers and staff, is happy. Despite the incredible recognition he has received, Koizumi remains grounded in his goal to simply continue bringing joy and fulfilment to customers through his cuisine. He is keen to participate in overseas events to introduce his cuisine to ever more customers, and always happy to take on new challenges. He is also involved in a project which seeks to reduce the salt used in his own cuisine and in turn use that salt to improve nutrition among children in developing countries. This awareness of the impact he can have on cuisine and how that affects the lives of many far beyond the counter in his Kagurazaka restaurant is proof of Chef Koizumi’s broad perspective and kind heart. 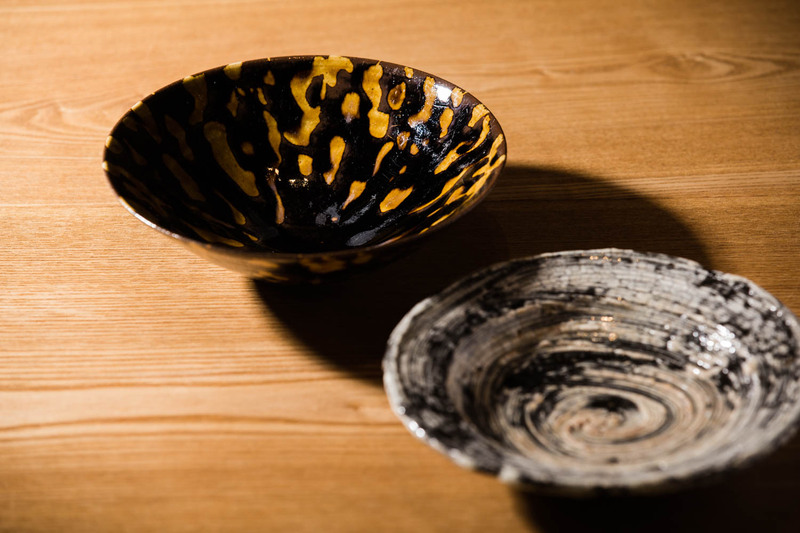 The tableware at Kohaku is all personally selected by Chef Koizumi, mainly through three preferred stores. With earthy colors, creamy tones, and simultaneous strength and beauty, the pieces show some consistency of style despite their striking individuality. A shallow bowl in the stunning golden and black-banded pattern of a tiger, the bold brush strokes of rice stalk ash glaze – each highlighting and complementing the delicious food cradled within. Many pieces were made by Jinenbo Nakagawa, in a somewhat rugged and natural style, many say like the man himself. 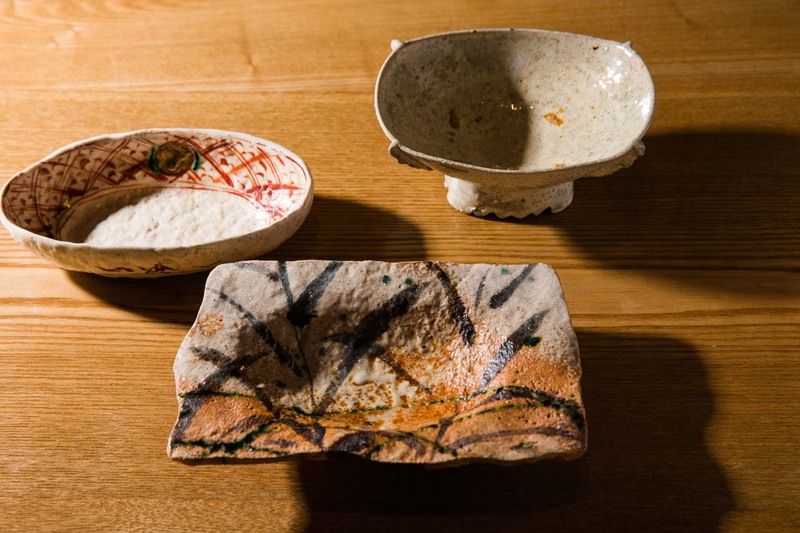 With a first name that fittingly translates as “nature boy”, his old Karatsu-style pieces are fired in climbing kilns in Saga Prefecture made with earth the potter dug himself from the nearby hillsides and mountains.